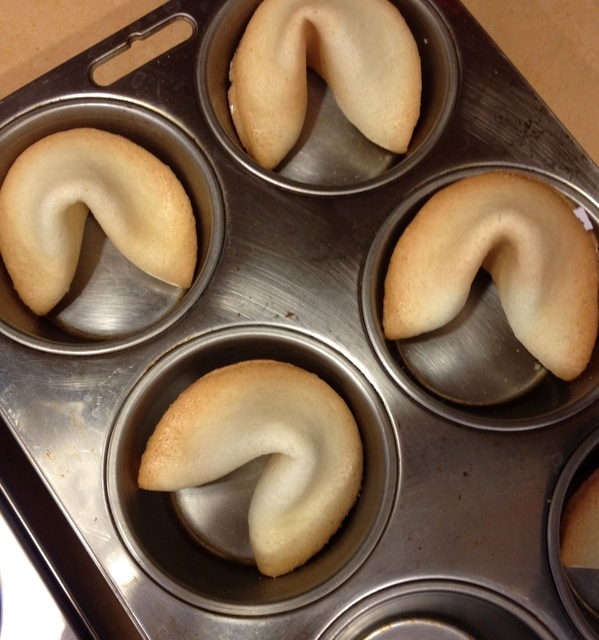 Did you know you could make your own fortune cookies at home? I love this recipe & I think you will too! These were a lot of fun to make but I have to tell you the first time I made them I folded them the wrong way…rookie mistake. I won’t be making that mistake again ;). I folded them in half then I folded them in half again & I couldn’t figure out why they didn’t look right. So don’t make the same mistake as me! *Make sure when you bend them over the mug that the seam is facing up. 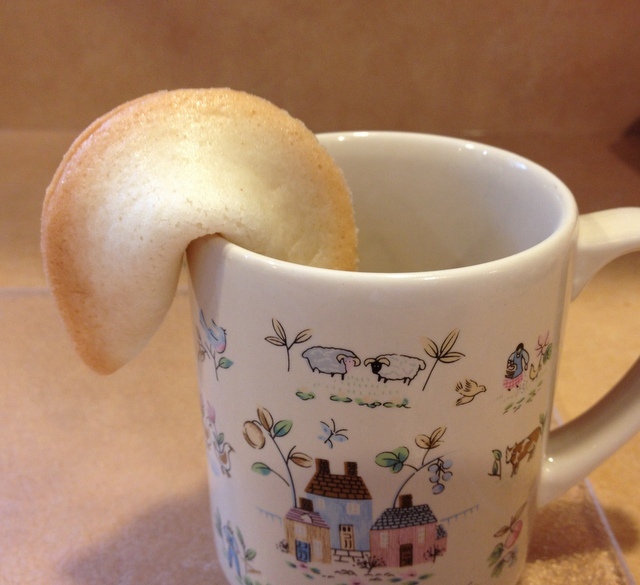 Homemade fortune cookies look paler compared to the factory made ones because they put food dye in them to give them a golden color but don’t worry these taste just as good! You can hand write your fortune cookie messages or type them up. I chose to type them up on the computer using size 11 font, print them, & cut them into strips. If your message is too long to fit inside the cookie you can fold it in half. If you need some ideas on fortune cookie messages to write try looking at fortunecookiemessage.com. *The trick with these cookies is to work quickly. 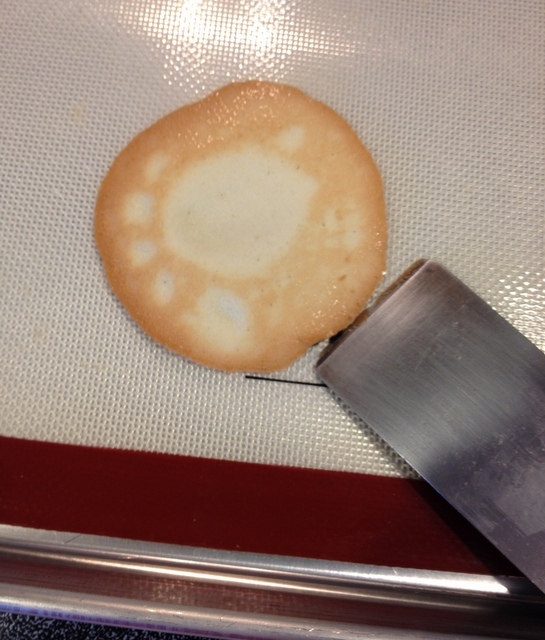 You only have about 30 seconds before the cookie becomes too cool to shape & mold into form. I have made them by myself but it helps to have an extra pair of hands so you can work faster. There’s a video on how to make them on youtube if you want to see how its done in action. *Tip: I have heard that wearing tight fitted cotton gloves helps so you don’t burn your hands when working with the hot cookies. Once the batter is all mixed together you will scoop tablespoons of it onto a cookie sheet & use the back of a spoon to smooth it out to form a 4″ circle. This is what they look like when they are baked. The outside edge is golden brown. Then you want to quickly flip it over with a sharp edged spatula, I prefer the metal ones. Then place your fortune in the middle. Next use the spatula to bend the cookie in half. Then you pick it up with your hands & gently fold it over the edge of a coffee cup (as shown below). You pull on the ends to bend it. Make sure the seam or opened end is facing up. Then you place it into a cupcake tin so it holds it’s shape while it cools. It cools quickly in about 10 minutes. Write out fortunes or type them up & cut them into strips. (You want them to be about 3" by ¼") Fold them in half if they are really long. Preheat oven to 350 degrees. 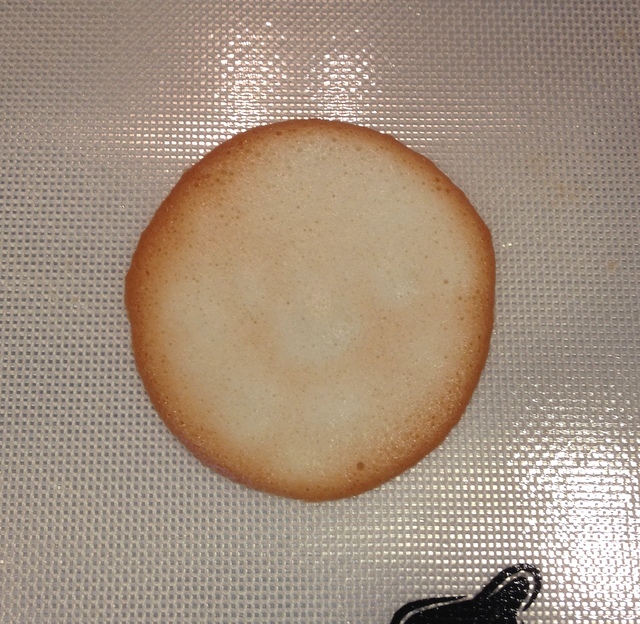 Line cookie sheets with silicone baking mats or parchment paper. Whisk flour, sugar, starch, salt together in bowl, set aside. In a separate bowl whisk egg whites until frothy. Add in vanilla, oil, & water & whisk together. 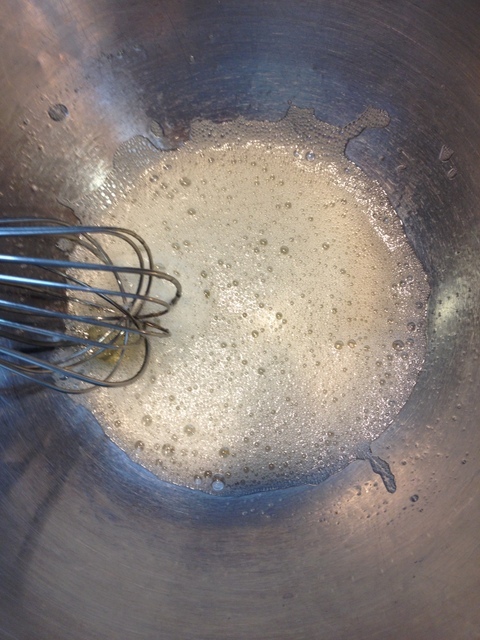 Add egg white mixture to flour mix & whisk together until smooth. Scoop tablespoons of batter onto prepared cookie sheets. Spaced about 3 inches apart. You should be able to fit about 6 on each cookie sheet. 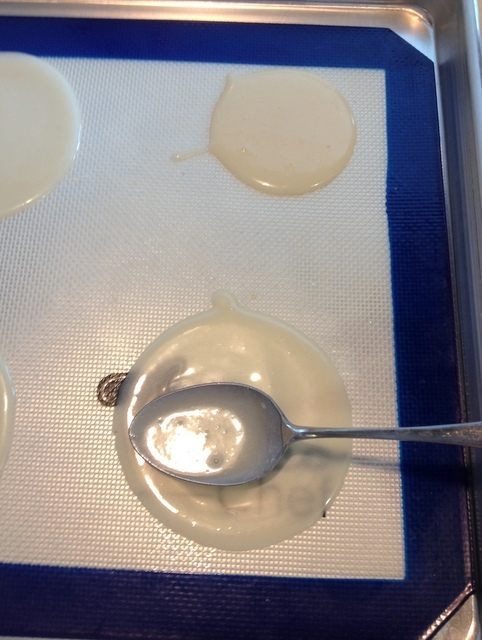 Using the back of a spoon spread out the batter to form a 4 inch circle. Bake for 8-12 minutes or until the ½" of the outside edge is golden brown. Remove from oven & flip it over with a metal spatula. Place fortune in the middle. Use the spatula to fold the cookie in half. Pick it up (it will be hot so be careful). Still holding the the folded cookie in both hands (between your thumb and index fingers) pull the ends down over the rim of a coffee mug, until the ends almost meet. 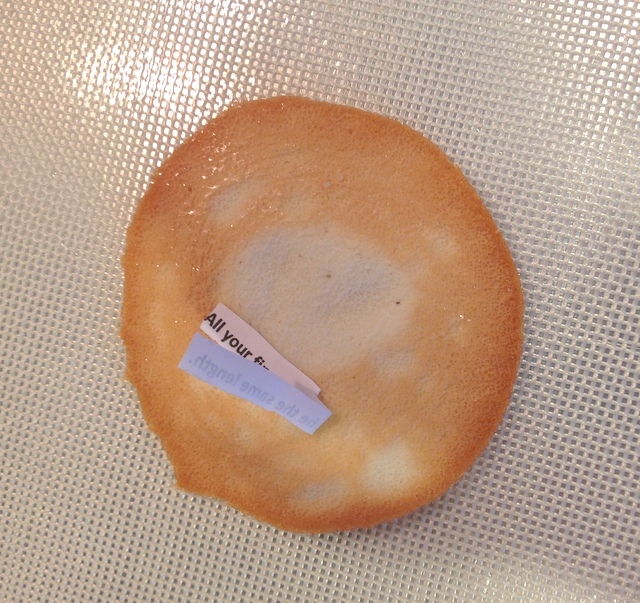 Remember the opened side of the fortune cookie should be facing upwards. Place each cookie into a cupcake tin laying down so it will hold its shape while it cools. It should cool in about 10-15 minutes. These look amazing! And so simple to make too! I have seriously always wanted to give these a shot :-) Pinned! Thank you Michelle! Let me know if you give them a try! 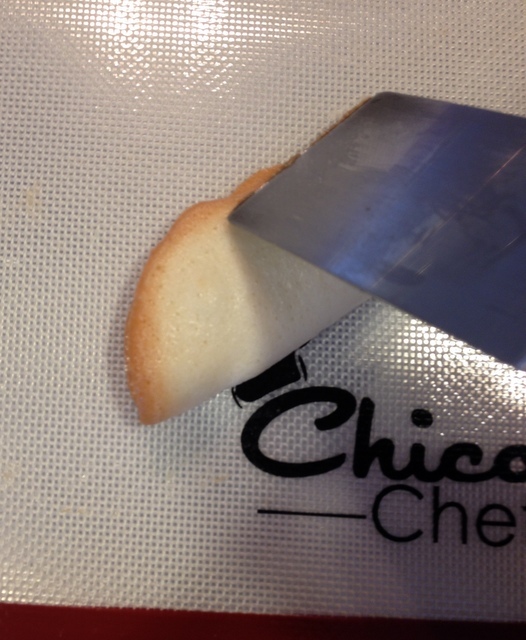 Never knew it was possible to make fortune cookies at home before. This is an awesome idea that I need to try and I love that you can make your own personalised fortunes! They were a lot of fun to make. If you give them a try let me know! Love these! I always admired them and wondered how it they were made. Here you have revealed all the techniques! Thank you, Holly and Katie! 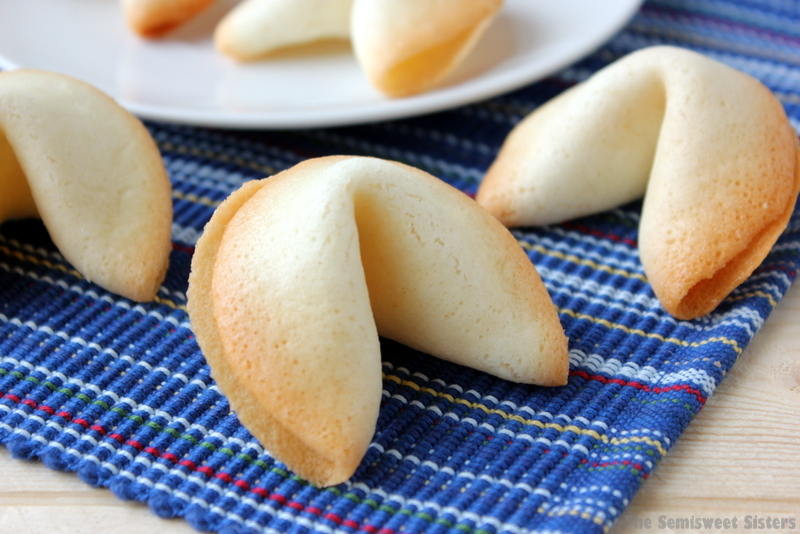 Fortune cookies are so great, they are light and crispy and you never get enough for the restaurant. Now we can have all we want haha. How do you keep the slip of paper from getting all greasy? 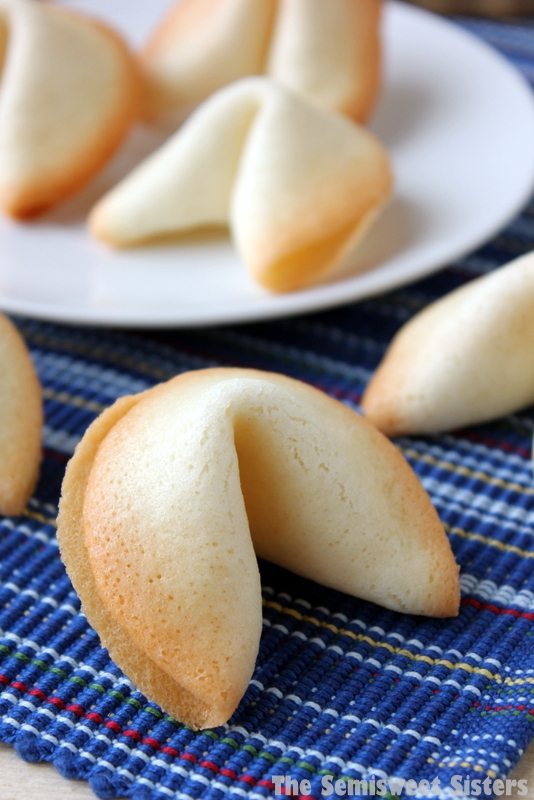 Fortune Cookies are not greasy & the cookies are already cooked when you place the paper inside so the papers stay completely dry. How long will the cookies stay crisp? I would like to make some up for a party but won’t have time the day of or the day before. Hi Glendra, They will stay crisp for a long time. After I made mine I kept them for at least a week & they stayed nice & crisp. Excited to try these Katie. I don’t know why I didn’t think of making them before. Gung Hay Fat Choy!!! Hope you like them Kristie! Do they come out crispy and crunchy? Yes, they come out crisp & crunchy. Mine turned out cake, but look pretty :) and are tasty! Any clue what I did wrong? Maybe I didn’t spread enough…Anyway, this is a fun and pretty thing to add to our Chinese dinner night! Thank you. Hi Shoni, Sorry to hear they turned out cakey. I’ve never had this issue. Did you use cake flour or all purpose flour? They turn out a lot better with cake flour. Also did you add corn starch? Maybe they were not spread out thin enough, that would make the thicker. Mine always turn out crispy. Hi Renee, I’m sorry to hear they started to crack on you before shaping. I’ve made these many times and I’ve noticed a few things. Cake flour works MUCH better then all purpose flour, I use swans. When I use all purpose I had some of mine do the same thing your taking about! The thickness didn’t seem to matter. It really helps to have a 2nd person helping you because time is of the essence, they cool down quick and then you can’t shape them. So I would only bake about 4 on each cookie sheet if your working alone. I hope this information helps. Thank you Katie! Great tips. I will try it again. It’s such a fun idea! how many cookies does a recipe make? Hi Lori, The recipe makes about 18. Could you add vanilla extract or almond extract to give more flavor? Hi Carolyn, The recipe does call for vanilla extract, you could try adding almond extract instead if you prefer. Thanks!